There are at least two timelines on the Internet that put the major Super Mario games in chronological order, as if they happened to one guy named Mario who has been living an extraordinary life. These timeline don't present Mario as a real man. The people who make these timelines aren't that free-thinking. But the makers of Mario timelines have asked questions that most people have lived their lives without asking, questions like: Does Super Mario Bros. 3 really take place after Super Mario Bros. 2? Surely, I figured, someone must have tried the same thing with Mario games. I was right. There are such people, and they're doing such a thing. Or at least they did. They make Mario timelines. Well, they make something more than that. They make timelines that explain how the Mario games connect and why they do. They explain when Mario was born, how he met Yoshi, why Mario was sometimes friends with Donkey Kong yet was sometimes trying to rescue his girlfriend from Donkey Kong (hmm...we've all had "friends" like that?). They explain the lore. But let's just start with the essence of what they do. Let's just check out the possibly-proper order for Mario games. That's it. Newer games are not included. Lemmy has a lot more games, but the two timelines line up well. That's because certain parts of Mario timeline-making are painfully obvious. For example: the games in which Mario is a baby (Yoshi's Island, Mario & Luigi Partners in Time, etc.) go early. Games that introduce the Koopa Kids, who the instruction manual of Super Mario Bros. 3 clearly state did not interact with Mario until Super Mario Bros. 3 go later than that game. It's a logic-puzzle, basically. Game X must be later than Game Y because of This Fact. But Game Y is clearly earlier than Game Z, so Game X goes before Game Z.
I foresee much pointless debating. I think UberMario will get as far as causing numerous discrepancies and then eventually give up. I may sound negative, but I've had many experiences with obscure and improbable theories, in which, of course, that was the outcome. This is my first and last post here. That wasn't Phantom7's last post, of course. UberMario challenged Phantom7 and said he was applying a double-standard. Phantom7 shrugged, apologized for his tone and wished him luck. "I'm not the type that is easily affected by negative criticism," UberMario recently told me over e-mail, reflecting on that exchange. "I pretty much glanced over comments like that." UberMario made his timeline because he'd seen the Zelda people making theirs. No one had made a good Mario one. He thought they violated too much of Mario's canon. He would not. He wanted to be true to the games. UberMario started with Yoshi's Island. There was no other good option. (Well, maybe there was one... but hold on a minute.) "In Yoshi's Island, a stork is carrying the Baby Mario brothers to their parents," UberMario told me, "so it made the most sense to me to start with the game that portrays Mario's 'first' adventure." Most of the Yoshi games fit together well, as did the time travel game, Partners in Time, but then UberMario had to get Mario to Brooklyn. Yes, he had to get him to Brooklyn. 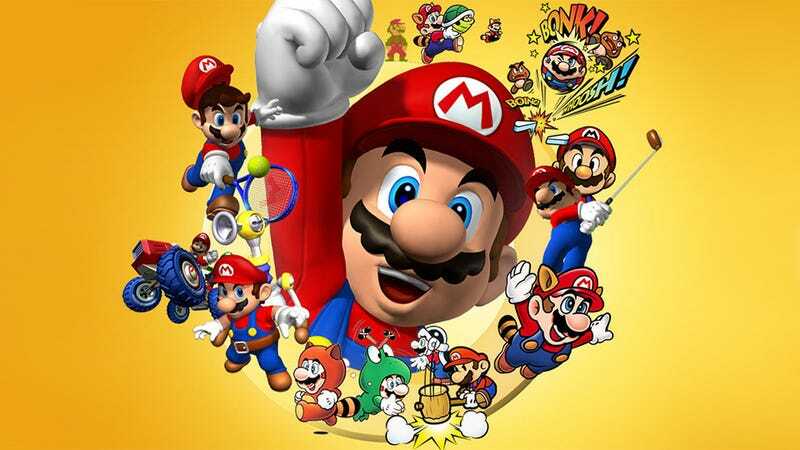 "It's a nod to the Super Mario Bros. Super Show," UberMario said. "The Mario Bros. were also mentioned to grow up in Brooklyn in several official manuals and player guides from the 1980s and 1990s, including SimCity's and Super Mario 64's." The Brooklyn thing fit, and that helped justify the industrial, earthly setting of Donkey Kong. That game introduced Mario to the world as a little guy called "Jumpman" who had to climb ladders and walk across steel girders to save his girlfriend Pauline from the dastardly Donkey Kong. UberMario needed to work in Donkey Kong 3 which seemed to fit into this phase of Donkey Kong being a jerk, though it featured a different protagonist, Stanley the Bugman. Actually, the Stanley adventure seemed to fit better before Mario saved Pauline: the order would begin with an angry Donkey Kong (DK3), then a more angry Donkey Kong (DK) and then... this is where it got tricky. UberMario wanted to include a batch of obscure Mario games from Nintendo's old, early-80's Game & Watch system. Those games featured both Mario and Donkey Kong, and one way of looking at them might let you infer that, in those games, Mario and the big ape were buddies. UberMario took a different approach: he decided that Mario had become the jerk. Donkey Kong had kidnapped Mario's girlfriend. Mario had saved her, but the guy was ticked off. So he was going to be something of a bad guy to Donkey Kong now. This was a useful epiphany because it explained how Mario went from rescuing Pauline to, basically, never seeing her again. She wasn't in the later, post-Brooklyn games that had Mario gallivanting through the Mushroom Kingdom. Mario had moved on in those games. He was trying to save the life of a different lovely woman. Mario was extremely ticked. He had a giant ape in tow who had attacked his girlfriend, and he had wasted several days getting him back near New York City. Before entering the limits though, he glared at Donkey Kong with a fiery look and smirked, and pulled him over to a nearby circus, where he got a job to whip the ape into doing humiliating tricks like playing hockey or juggling on a ball. Mario had told Pauline to come see the show, but when she came she was appalled at how much Mario had changed, feeling he had become cruel and almost evil, and that she felt that he wasn't the man she fell in love with. Mario was shocked with disbelief on how Pauline could not love what he was doing—punishing the animal who had attacked her—and was even more flabbergasted when she said their relationship was through. Mario then looked at Donkey Kong and wondered what had gone wrong with his life, and after pondering for a few days, decided to quit the circus so he could take care of Donkey Kong and eventually set him free. Donkey Kong was still bitter towards humans, but the change of heart from his captor in the months before his freedom resulted in him having a slight form of respect towards people, if not that much. The Super Mario games came after that, and more or less add up to a succession of attempts by Bowser to kidnap Peach. Tetris Attack gets shoehorned in there because, despite its Tetris-y name, it features Mario's dinosaur buddy Yoshi and a storyline that actually fits well amid the other catastrophes of the Super Mario Bros. era. After UberMario started posting this timeline, he got some pushback regarding where he placed Donkey Kong. There's a bit of debate about whether the Donkey Kong in Donkey Kong is the one who has been in so many other games since then or if he's actually the father of the one we've seen in the likes of Mario vs Donkey Kong, Mario Tennis, Mario Kart and other games. That's why some people think Donkey Kong should go first, before he gets old and cranky and, according to Donkey Kong Country becomes Cranky Kong, father (or whatever) to the spry Donkey Kong we've seen in other games. UberMario buys the Cranky-was-the-first-Donkey-Kong theory and thinks his placement works. One of the reasons it might seem preposterous to put Mario games in a timeline is because Mario games don't have much more of a storyline than Mario rescuing the princess in some weird land that has giant mushrooms and mean turtles. Another reason is that many other Mario games have even less story than that. If you're making a Mario tmeline, where do you put Mario's tennis games? And his kart-racing games? Did Mario really have time to become a doctor, referee Mike Tyson's Punch-Out and teach typing? The Mario timeline-makers don't shrink from questions like these. What they do is tend to bundle a lot of that together in a phase of Mario's life when they say he was dabbling with various careers. Dr. Mario, however, can't fit there, so they assume that Mario may have learned medicine then but didn't practice it until later. It has been brought to my attention by an attentive tourist that, according to the Dr. Mario manual, Mario was alerted to the Virus problem by "Nurse Toadstool", seemingly moving the game out of the Employment Era and into the Mushroom Kingdom Era. While the manual is less important than the game itself, the game doesn't have anything to contradict this claim, so I'll accept the evidence. Other good evidence is that the Viruses in Superstar Saga look an awful lot like the ones in Dr. Mario, suggesting that the ones in the game are a Plit strain that may or may not exist on Earth. The reason I have not moved Dr. Mario on the timeline is twofold. First, I still believe that Mario originally took up medicine while on Earth, even though this is not apparently what's shown in the Dr. Mario series. Second, the Dr. Mario games don't really offer any clues for where they might go in the timeline. There are very few characters, and given the nature of the game, it's hard to argue that any character was purposefully excluded. (For example, this could be after the Mario-Luigi reconciliation, even though Luigi isn't in it, because maybe Luigi never became a doctor because he wasn't job-hunting back on Earth.) In addition to that, Dr. Mario is less an adventure than, say, Mario 3, which surely took several days or longer for the real Mario to complete. The events of Dr. Mario aren't necessarily connected, and might have taken place in some string of afternoons or whatever that would be hard to trace. It is, therefore, my opinion that Mario originally practiced medicine on Earth, but that the events pictured in Dr. Mario and its spinoffs happened in the Mushroom Kingdom. The jury is still out on when the games might actually have happened, and in this case, I'm not even sure the question makes sense except to offer a timespan that might coincide with other games. So I will leave Dr. Mario in with the Employment Era, since that's where the ball got started rolling, until such time as I have a better idea of where to put it. UberMario agrees that Dr. Mario needs to be placed somewhat late in the timeline. Mario learns medicine early, but Dr. Mario and Dr. Mario 64 just can't have happened during that odd-job part of Mario's life. Dr. Mario can be wedged in, but other games just flat-out don't fit. Super Mario Galaxy, for example, is essentially remade by Super Mario Galaxy 2, according to UberMario, who says the two games have the same plot are the only two that he couldn't put in the same timeline. "SMG2 was pretty much an entire rescripting of Super Mario Galaxy's plot with new levels and new concepts. (The biggest offender is the fact that the Star Festival only happens once every 100 years, yet is the introductory premise for both games,) I've played many of the Mario titles, including less common ones like Dance Dance Revolution: Mario Mix, Super Mario RPG and the Game & Watch Gallery games, but haven't seen any other issues that can't be circumvented with creativity." LemmyKoopa, whose timeline includes many more games, dedicates a couple of sections to games he says won't fit. This section comes after his section on the Mario Party games which he rationalizes as occurring after Bowser gave up on capturing Princess Peach and downgraded his threat level to just being the guy who tries to ruin Mario's parties. He leaves out several Wario games, since he sees them branching off into their own thing. Several games are remakes—ports to other machines, actually—and don't need to fit. And the Smash Bros. fighting games that star Mario, Bowser, Zelda, Link and just about every other major Nintendo character? First, the Smash storyline has nothing whatsoever to do with the Mario storyline. Second, Mario is no more important than any other character in this game. Third, if these games really happened, it would throw the whole Mario Universe into chaos. I mean, in Melee, Bowser can beat Mario just as easily as the opposite. Peach can beat Bowser! Mario can beat Peach! Yeah, Mario and Peach beat each other up all the time. Right. Short and simple, it is very unlikely that these two games actually happened. Mario 3 happened, Smash Bros. did not. Or if they did happen, it was in some kind of time rip that can't be tracked for purposes of this timeline. Therefore, even if these were true Mario games they would not be entitled to a spot on the timeline. The timeline is for stuff that happened, you see. No Smash? Fine. But the game that seemed most conspicuously-absent, just from UberMario's timeline, was Super Mario Bros. 2. I thought this was maybe based on the game having non-Mario roots. Not really. UberMario told me he skipped it by accident, but—as always—there was a wrinkle. "Since Super Mario Bros 2 was just a long, strange dream by Mario. I feel that it really has no strict placement and could be pretty much inserted anywhere." UberMario hasn't touched his timeline in a couple of years. LemmyKoopa's is missing some of the newer games as well. The website Something Awful had a run at making one, goofily picking Mario's age for his various exploits. While people feverishly work on Zelda timelines, though, there is no ongoing major Mario timeline movement. "I'll revive it if people are still interested," UberMario told me. "I had originally stopped partially because I felt that my last few chapters had not garnered that much interest, and partially because I thought that it would look better in comic format. Ideally, I'd love to find someone who would be interested in making a webcomic with me (since I'm terrible at drawing, especially on a computer), but if not and people are interested, I might continue it." The Mario games don't beg for an official timeline the way the Zelda games do. But where there are fans and there is an Internet, this is the kind of thing some people will try. If not right now, they'll certainly get to it in the future. After all, someone needs to figure out where New Super Mario Bros. 2 fits into all of this.